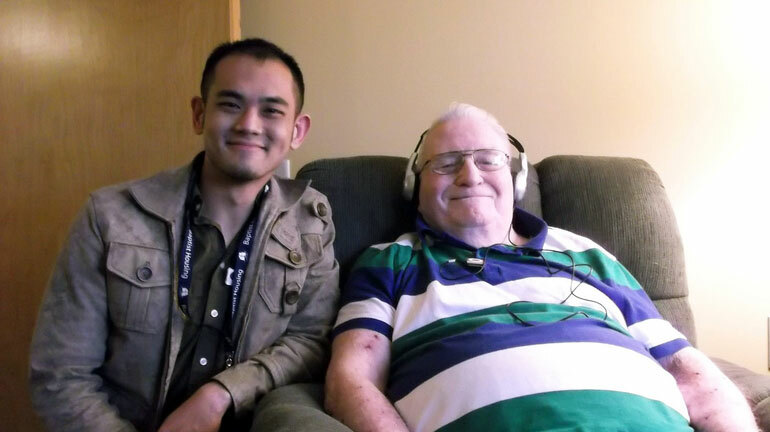 UBC Okanagan student Gary Su with one of the Baptist Housing clients he worked with during the Music and Memories project. As part of a Sociology of Global Aging course taught by UBC’s Mary Ann Murphy and in collaboration with UBC’s Community Service Learning Program, 25 university students were partnered with residents of three Baptist Housing homes in the Central Okanagan. The students worked with residents who live with some form of dementia and met with their families and caregivers to develop a personalized music playlist. For a number of weeks, the students visited the residents to monitor and record the effectiveness of the music selections. Gary Su, a fourth-year psychology student at UBC, says the three strangers assigned to him affected him deeply. When he talks about these residents, the experiences still touch his heart. He describes one patient as initially socially isolated, spending much of her time alone in her room. After weeks of listening to music on her iPod, he would often find her waiting for him, eager to engage in a conversation, and talk about his day at university. Su’s biggest take away from this? Not all learning comes from the textbook. “Each of them taught me something,” he says. “You see all the theory that you’ve read in your textbooks, and all the material you’ve learned and suddenly you realize it is taking place right in front of you. “These residents taught me how cool they could be, and how friendly and easygoing they could be, and how vulnerable they were due to the progression of the illness." The Music and Memory program at Baptist Housing has several goals, one of which is to use music to reduce medication for people suffering from dementia and other cognitive challenges. It is also hoped that residents with memory loss find renewed meaning and connection in their lives when they listen to the music. Interior Savings and its Community Investment Fund donated $28,560 to purchase iPods, headsets, and iTunes cards for the project. Interior Savings’ CEO Kathy Conway says it’s important as a local credit union to recognize and support the programs that really matter to this community. Rachel Lewis, Clinical Educator with Baptist Housing, says the partnership is a cornerstone of Baptist Housing. She can’t thank Interior Savings and UBC Okanagan enough for their help with the Music and Memories project. A special tea will take place at the Village at Mill Creek (1450 Sutherland Ave) March 8 at 2 p.m. to showcase the results of the Music and Memories program. Media is welcome to join representatives from Baptist Housing, UBC Okanagan, and Interior Savings who will be on hand to speak about the remarkable results seen so far.